Since Korea suffered the economic crisis, the economic and entrepreneurial atmosphere has been significantly changed in the country. 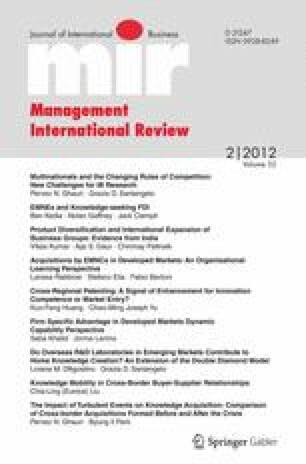 Given the dramatic environmental turbulence, this paper raises key questions: (1) What are critical factors affecting knowledge absorption from investing firms in cross-border acquisitions (CBAs) and (2) whether the main factors affecting knowledge acquisition in CBAs have evolved accordingly or not. In order to identify the different learning patterns in CBAs, we divide a sample into two groups (i.e., CBAs that were formed before the crisis and those that were formed afterwards). Regression analyses show that the two most powerful explanatory variables for knowledge acquisition only in pre-crisis are prior-related knowledge and compatible organizational culture. In contrast, intent to learn and efficient internal communication play a pivotal role in acquiring foreign knowledge from multinational enterprises (MNEs) in the CBAs formed after the crisis. Integration into foreign network and participation of foreign expatriates are significant determinants irrespective of the prevailing environment conditions. Although this paper contributes to the current literature on knowledge acquisition and CBAs, we also suggest that the relative importance of the determinants of knowledge acquisition in CBAs are also essential during the economic crisis in Western economies.